The Art of Persian Music uses a multimedia, multifaceted approach to introduce the music and culture of Iran through its art. Persian music is as fine, subtle, and beautiful as a Persian carpet, and yet for the most part it has remained unknown in the West. It has unique aesthetic qualities quite different from Western music. It is monophonic, undramatic, and mostly solo, with rich modal variety and melodic subtlety–an intimate music of the spirit most appreciated by the initiated. This book provides the keys and definitions essential for understanding Persian music: its history, instruments, repertory, organization, rhythyms, and modes (or dastaghs). Through quotes and anecdotes by and about masters past and present, the reader can grasp the ethos, spirit, and philosophy of Persian music. Filled with exquisite illustrations of instruments and musicians from museums around the world, as well poetry and calligraphy, this volume will introduce the enthusiast both to the whole aesthetic of Persian art and the art of Persian music. Although it is based on the most recent scholarship, this book is intended for the general audience. All details superfluous to the general reader have been intentionally omitted. But The Art of Persian Music is not just a compilation from past sources–it is full of new ideas and insights that illuminate the state of contemporary Persian music and reward both the layman and the specialist. Anthology of Persian Music, the 72 minute compact disc which is included with the book gives the reader and listener a taste of some musical styles, both rare and remarkable. A sophisticated, valuable introduction to a musical heritage largely unfamiliar to Western ears, this beautifully illustrated volume dispels the common misperceptions that Persian music is simple, sad or repetitive. Using many different seven-note scales comprising modes with distinctive atmospheres and symbolisms, Persian music often employs micro-intervals which divide the octave into more than 12 semi-tones. Performers have wide latitude for interpretation and improvisation. Replete with paintings, calligraphy and poetry as well as photographs of instruments and performers, the text surveys religious and lay chants, classical song, urban entertainment music, traditional regional forms and contemporary art music. The accompanying compact disc lets readers sample a variety of musical styles. During is a Paris-based musicologist; Mirabdolbaghi teaches Persian music in Nice; Safvat, a musician, teaches in Tehran. This innovative introduction to the music and culture of Iran combines text, illustrations, and a sampler disk in a single package. Important terms, instruments, repertories, and personalities are cataloged and thoroughly explained, making it accessible to anyone interested. The high price tag is the only drawback. However, the distressing increase in simplified, popular accounts of Middle Eastern culture makes this serious study al the more valuable. For large music collections. Directed to non-specialist readers, this beautifully illustrated book is an introduction to the instruments and aesthetic principles of Persian classical music. The most valuable sections are Mirabdolbaghi’s compilation of short statements by Persian musicians, and the final “Contemporary Master’s Lesson from Dariush Safvat.” The chapters written by Jean During combine penetrating remarks drawn from his own experience as a performer, useful sections on poetry and mysticism, and capricious rankings of genres and ethnic groups according to “levels” of musical culture. The accompanying compact disk contains 12 excerpts from very fine performances, only one of which is readily available elsewhere. Combining elements of a scholarly monograph, a general reader’s introduction, and a coffee-table book, this work concentrates on the classical music of Iran, music created by learned and highly trained musicians for an intellectual and social elite. It introduces the reader to several important aspects of Persian music: scales, rhythms, and forms; the radif, a large repertory of music that provides a basis for improvisation and is the principal device of transmission and pedagogy; instruments, described in meticulous detail; the long though imperfectly known history; the relationship to other musics of Iran. These chapters, written by the principal author, the French ethnomusicologist Jean During, are supplemented by two others: Zia Mirabdolbaghi provides a series of excerpts from interviews with distinguished musicians, and the renowned master Dariush Safvat gives his views in a “lesson.” The book is lavishly illustrated and accompanied by a CD providing a short historical anthology of Persian music recordings. Well written, with good bibliography and index, it will be useful to all levels of students, from high school up, and to the professional scholar. The Art of Persian Music presents, in a beautifully illustrated volume with accompanying CD, an expansive view of the art of traditional Persian classical music seen from its relationship with other artistic forms such as painting, poetry, and calligraphy. It provides the reader with a balance between musical analysis and contextual descriptions of the place of music in the arts and Its central connection to Persian mystical philosophy. Mage Publishers has produced a book on Persian music intended for the musically inclined general reader, both Western and Iranian. Other than a few examples of rhythms, this book contains no musical notations but supplies many photographs of instruments, musicians, and paintings, as well as Persian poetry. Although During is the primary author, this volume presents a multifaceted approach which includes the collaboration of and materials from Mirabdolbaghi and Safvat, in order to give both Western and Persian perspectives. The approach of all three authors, however, appears to have an essentially unified point of view. This point of view is one commonly found in Iran among the elite circles of Persian musicians and musicologists and focuses on a pure “art” music tradition, the music of the radif, performed within the context of a mystical purpose and philosophy. Researchers trained in the Western academic tradition have generally focused on the analysis of dastgah and secondarily on the art of improvisation (Nettl Farhat, Sadeghi, Zonis). It has largely been the works of During and Safvat that have presented the metaphysical aspects of this art to the West. The dichotomy between the traditional Western academic approach, which focuses on structural analysis, and the Iranian mystical emphasis on religious morality and transformation, has been unfortunate, as each by itself leaves the reader with an incomplete understanding of the nature of this music and each has a distinct bias which often makes these two approaches seem mutually incompatible. While attempting to present a balance between the technical and the aesthetic, the current work, however, still approaches Persian music from a predominantly preservationist and religious perspective. Reading this work requires experience with music and often with Persian music and philosophy in order to understand and follow many of the authors explanations. Far from being accessible to the general reader, the often esoteric and ambiguous explanations of the technical aspects of music necessitate a musically literate background. The addition of specific musical examples, either in notated or recorded form, could have alleviated much of this obscurity. In leaving out music notations, explanations of music structure often lack concrete examples to illustrate their meaning. The accompanying CD, which in itself offers a valuable historical survey of traditional classical music, could have been more useful to the text if it had provided specific examples to illustrate aspects of rhythm and musical phrasing or differences in the forms of pishdaramad, avaz, tasnif, and reng. Each example is well documented and explained, however, in a thorough discography found in the back of the text. The CD contains both archival and contemporary recordings, including performances by two of the authors, Mirabdolbaghi and Safvat. The authors have introduced new material and amplified concepts introduced by other authors, but their explanations often suffer from lack of concrete examples and sources. Much of the historical material, for example, has a speculative nature due to the small number of historical records. According to the works cited in the text and the bibliography, During used the important basic research in this field but seemed to rely primarily on his own observations, experience, and publications and those of his co-authors. The photographs, while adding to the visual perception of Persian music, could have been more specifically tied to examples and explanations in the text. The chapter on musical instruments does this well with historical paintings in addition to photographs of the contemporary instruments and musicians. The captions for these Illustrations are found in the back of the book. An aspect of the multimedia approach of this work is the inclusion of excerpts of classical Persian poetry referring to music. These are written in Persian calligraphy with few translations provided, and they lose some of their supportive value for the reader who is not fluent in Farsi. The book is divided into the following chapters: Prologue; Historical Survey; The System of Persian Music; the Instruments of Yesterday and Today; Poetry and Music; Music, Mysticism, and Metaphysics; Suprasensory Perception or Imaginal Vision; The Masters Viewpoints; A Lesson From Master Dariush Safvat; and Epilogue. The “Prologue “discusses the aim and point of view of the book, conceptions and misconceptions about music, and the types of music found in Iran. The “Historical Survey” sketches a brief historical overview, traces the influence of Persian music in the surrounding regions, presents brief biographies of some important figures in Persian music, and compares Persian music with Western classical music. It discusses traditional style, as well as modern trends. The next chapter, “The System of Persian Music,” analyzes the musical structure, which is the subject most emphasized in other works about Persian music. This discussion includes intervals, mode radif, dastgah forms, rhythms, and ethos, as well as improvisation. “The Instruments of Yesterday and Today,” by Mirabdolbaghi, is by far the best written and most informative of the chapters of this book. Mirabdolbaghi’s background in art and artistic theory has enabled him to conduct a historical and iconographic analysis of the musical instruments depicted in Persian art, as well as to describe their morphology and compare it to the morphology and playing techniques of contemporary instruments. This chapter contains much specific and concrete information about current and historical instruments that is not available in other works. The ample paintings, drawings, and photographs of instruments and instrumentalists are well correlated to the explanations in the text. The second part of the book is devoted primarily to aesthetic considerations, as well as to the relationship of music to other art forms. “Poetry and Music” discusses the structural relationship between these two arts, as well as poetry’s role as an organizing principle in the performance of a dastgah. “Music, Mysticism, and Metaphysics” explores the philosophical aspects of Persian music found both in the poetry used and in the mystical view of music. “Suprasensory Perception” compares music to calligraphy and painting. “The Masters Viewpoints” presents a variety of perspectives on aspects of Persian music by different traditional masters. Included in this chapter are a few stories from the life of the old music masters which give the reader a glimpse of the relationship of the musicians to their students and to their audiences, and provides a sense of immediacy lacking in most theoretical discussions. “A Lesson from Master Dariush Safvat” gives an interesting perspective on the therapeutic nature of Persian music, which is related to and expands upon Safvats dichotomy between artistic and entertainment music (Caron d Safvate 1966:234). This chapter compares natural and effective music, which are defined by specific parameters and examples. The “Epilogue discusses the effects on traditional music of musical recordings and the increased accessibility of music. In expanding the concepts of radif, rhythm, and form currently understood in the literature, the authors of this work have gone beyond the surveys and structural analyses of music found in other works and have provided the next generation of scholars with new facets to study and systematize both in understanding the structure and style of the music, as well as relating the music to other art forms and to its role in the life of the musician and the Iranian peoples. Even to the casual observer, it is immediately apparent that this sumptuously produced volume, with its coated paper and 90 illustrations, many in color and very artistically done, is the ultimate coffeetable book on the subject of Persian classical music. As one delves further into the book, one also notes that the book has been written for a general audience. As During puts it, “We have been careful not to overload the reader with technical details.” And indeed he has not. There are no notated musical examples except for a couple of rhythms and little of the scholarly detail that characterizes During’s La musique iranienne: Tradition et evolution, published in Paris in 1984, for instance. To be sure, a nonspecialist will find the book a lovely way to get acquainted with Persian classical music. The sections which describe the instruments and the forms of Persian classical music are clearly presented. The pictures of the instruments are informative. A fascinating section, compiled by Mirabdolbaghi, is the chapter called “The Masters’ Viewpoints,” in which twentiethcentury greats in Persian classical music, such as Morteza Neydavud, Nur ‘Ali Borumand, Ruhollah Khaleqi, and Abolhasan Saba, talk about the music, its character, pedagogy, improvisation, and so on. Finally, the compact disc which accompanies the book provides a set of excellent recordings, several archival, which give the interested nonspecialist an aural snapshot of what Persian classical music is all about. The first half of the book, all written by During, is devoted to a general description of Persian classical music, including chapters on its history; the structure, modal system, forms, and rhythm of the music; and the instruments. These sections contain much intriguing and useful information, but overall the writing and organization suffer from a certain discursive quality. The section on the theory and dastgahs (modal systems) of Persian music would have been helped by a few wellchosen notated musical examples. In the discussion of the modal system, for instance, During comments, “Avaze Afsharl is close to Shur because of its tragic and somber character, but in time, it calms down and becomes less somber” (p. 7). Statements such as this are a good example of why it is much better to listen to music than to talk about it, but in the absence of a recorded example for each dastgah, a notated musical example would have been better than words. Likewise, a little more precise detail would help the reader understand During’s discussion of Persian poetic meters. For instance, we read that a common meter is uuuu uuuu, where u = a short syllable and = a long syllable. Professor L. P. ElwellSutton calls this meter moytass mosamman makhbun in his article on “‘Aruz” in Encyclopaedia Iranica (p. 676). Most readers probably do not care what the name of the meter is, but, since the general subject is music, they should be told that when a poem in this meter is sung, it can be accompanied by a musical form called “kereshme,” a rhythmic gushe (a gushe is a part of a mode such as shur). Kereshme, whose rhythm is precisely the same as the poetic meter, can appear in more than one dastgdh. It is performed both with voice and by solo instrumentalists. The point here is that there is a direct link between the poetic meter and the appearance of this rhythm in Persian classical music. The popularity of the poetic meter has transferred into music. The second half of the book contains an extensive discussion of the unity of arts in Persian culture, with an implication that this unity is channeled through a particular metaphysical vision of music, art, and poetry that is linked to Sufism (pp. 153200). To be sure, there are connections among these manifestations of Persian culture, just as there are among the arts of any great civilization. However, there is a certain misdirection of emphasis that arises from the writers’ attempt to connect all these hallmarks of Persian culture to a world view based in Sufism, or at least a search for selfknowledge analogous to that which a Sufi might undertake. There are a few other technical problems with the book that could have been cleared up with more careful editing. One concerns the Persian poetry: bits of Persian poetry, beautifully written in Persian by calligrapher A. H. Tabnak, are scattered throughout the book. Sometimes this poetry is translated, sometimes half translated (as with the excerpt from Manuchehri, p. 122), but often it is not translated at all. This seems a shame, since the theme of the poems often ties in with that of the text. The second problem has to do with the illustrations. Some have captions, some are described at the end of the book, but others, such as the photograph on page 142, are not identified in any way. Again, it is a pity to use illustrations, such as these that have historical value, as mere decorations. In the first part of this century, Persian classical music, along with the rest of Persian culture, was impacted by its contact with the West. As a result, some instruments from the West began to be played in Iran, people tried harmonizing traditional melodies, new forms were introduced, and musicians began playing together in larger groups, particularly for radio and television. The presentation of Persian classical music in this book is, in a way, an attempt to describe this music in a more traditional context, linking it to traditional Persian arts and spirituality, and with virtually no reference to Western contact. Since Persian classical music is one of the most intricate and subtle classical music traditions extant in the world today, it would be interesting to read a discussion of this music that attempted to show what Persian music really is or is not and what a range of contemporary master musicians, whose numbers are only a few hundred, think about their music and its performance today. With lavish, colorful illustrations and a reflective text, the authors of The Art of Persian Music attempt to evoke the character of classical Persian music. The writers seek to combine the definition familiar to the scholar and teacher with the “vision” of the Persian classical music lover; they aim “at expressing what could be considered as most important by lovers of Persian music” (p. 13) in terms of musical aesthetics and relationships among Persian musics and other arts. Their threefold purpose is to provide “keys and definitions necessary for the overall understanding of the structure of Persian music,” to “define its aesthetics, ethos, spirit, and philosophy, through measured reflections and significant anecdotes” and to outline “the main historical trends and their evolution” (p. 13). Few musical transcriptions appear in the book, nor is there a great deal of analytical detail of any sort; the reader’s understanding depends on the textual referents and the music examples recorded on the accompanying compact disc. The intended audience is one of nonspecialists. The authors address their work both to Western musiclovers and to expatriate Iranians “concerned about passing on the spirit of their traditions to their children” (p. 11). “With a view to this duality,” Jean During writes, “two complementary perspectives are juxtaposed in this book: on the one hand, an Iranian speaking of his own culture [Zia Mirabdolbaghi], and on the other, a ‘foreigner’ [During] trying to look at things from an outsider’s viewpoint” (p. 11). Thus the authors bring their long and rich experiences with Persian music to bear on the volume. During, a French musicologist known primarily for his work on Persian and other Middle Eastern melodic systems and on Sufi religious music, writes about the history and structure of Persian music, the relationship of poetry and music, and of music, mysticism and metaphysics. Mirabdolbaghi, an Iranian expatriate trained as an art historian who now teaches and performs Persian music in France, writes about music and the visual arts and presents an enlightening compilation of reflections about aspects of Persian music expressed by noted performers and teachers, entitled “The Master’s Viewpoint.” During and Mirabdolbaghi collaborate on a chapter on musical instruments, and the volume closes with a “lesson” given by Dariush Safvat, a multifaceted performer and master of Persian music. Such language is colorful and suited to the introductory purposes of the book inasmuch as it captures the attention and imagination of the reader. The changing perspectives among the authors and musicians whose views they quote and the subjective language of description admit complexity and even contradiction: for During (and indeed for many MiddleEastern musicians as well) melodic modes both do and do not bear associations with moods: “These general assertions [of mood] do not really interest musicians, for they adapt each mode to their own humor. However, it is obvious that when someone is asked to play or sing, he always tries to pick out the mode best suited to the circumstances and to his own mood (or possibly to the poem he proposes to sing)” (p. 77). Similarly, he acknowledges that the term gushe “is applied equally to materials that differ considerably in importance, in function and position in the system, and in form” (p. 79). This approach may encourage students to formulate their own questions, and the book offers information sufficient to provide a basis for further inquiry. The bibliography guides readers to more explicitly analytical materials. The quantity and quality of the illustrations-including photographs of musicians and instruments, reproductions of Persian miniatures and contemporary works of art, and excerpts from classical Persian poetry-is an outstanding feature of the volume. Beautiful and evocative photographs of musicians appear (notably on pp. 136 and 138). The list of comparisons between Persian music and poetry (p. 161) is useful and the chart of types of Persian music (p. 25) has great explanatory value. The accompanying compact disc contains beautiful examples of the music with annotations (pp. 26065, reprinted on the leaflet included with the disc) that are easy to grasp. One thinks one follows During’s meaning, but, for lack of definition, one is not always sure; the comparison with the sound of bells is helpful but one wonders whether one shares his meanings of luminosity, sophistication, unnaturalness, and equilibrium or would recognize these qualities upon hearing them. Some explanations are simply unclear. One questions both the accuracy and the validity of the dichotomies of “the ‘classical’ and the ‘popular’ (or folkloric), or between urban/rural or written/oral” with which the section “Musical Types in Iran” is introduced (p. 19). In the ensuing discussion the reader struggles to grasp the boundaries or contiguities of terms such as sonnati and mahalli and relationships between “categories,” “genres,” and “forms” (pp. 1923): the authors list two “genres” and then proceed to name at least five more. The reader is occasionally confronted with particular viewpoints in the guise of statements of fact: “In the Middle Ages, Oriental and Occidental music were very much alike” (p. 47). Musical terms such as gushe and mava are used before they are explained (pp. 3334, 35). The word “mode” appears as a gloss for dastgah, avaz, and maye on the same page (p. 48). When their definitions are given (pp. 6063), the authors use a great number of technical terms, some of which may not be necessary for the beginner. These pages may well prove confusing to the uninitiated. Generalizing about music in the “Islamic world” (p. 28) is always problematic, as the majority of Muslims live outside the Middle East. The theory that the Islamic concept of unity or oneness (towhid, p. 185) permeates musical expression and visual art is often unsatisfying: it is not easy to accept explanations of sophisticated and varied art as necessarily the manifestations of a single concept let alone to understand exactly how that concept influences expressive culture. Happily, the authors’ treatment of this idea remains gentle and suggestive, never insistent or pedantic. The authors’ efforts are diminished by insufficient information at a few points. Many pictures appear without captions; the list at the back of the book does not identify all of them nor does it explain what the pictures represent, leaving interpretation to the imagination of a reader potentially influenced by popular (and often erroneous) stereotypes of the Middle East. Impressive paintings such as the modern work seemingly inspired by the fourteenth century poet Hafez (p. 159) cry for identification. Some illustrations are mystifying at first, for instance the photograph on page 18 which, upon comparison with others in the book, seems to be a view from the bottom of a tonbak (an hourglass drum). Relationships among pictures, such as details apparently of the same drum (p. 14, 18, 49, and 149) may be lost. Poetic verses serving as captions for illustrations (and even the quotation of a “famous exhortation,” p. 154) are untranslated. The poetry is impressive and good translations would have increased the impact of the book (the quotation on page 122 is translated but bears no attribution). These sorts of omissions could easily have been remedied without disturbing the aim or the tone of the book. The Art of Persian Music will best serve individuals and collections concerned with MiddleEastern musics, melodic systems, performance and improvisation, and relationships among the arts. It is valuable for the broad perspective offered by the authors and for its multitude of illustrations, unique in works on MiddleEastern musics. Instructors will find it easy to excerpt individual chapters for topical reading and this quality renders the book more useful than many. 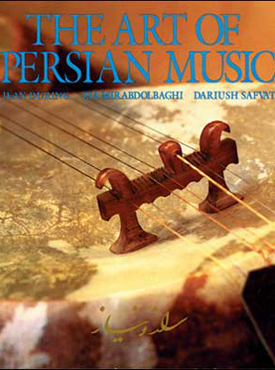 Mirabdolbaghi’s “Masters’ Viewpoints” offers “a brief glance at certain aspects and ambiguities of traditional Persian music, as viewed by some renowned masters” (p. 201). In fact the entire book may be viewed as a suggestive introduction to “Aspects and ambiguities” of Persian classical music, and this is no minor achievement. The Art of Persian Music supplements and complements this literature in speaking to a less-specialized audience, in following an approach that relates Persian music to Sufism (the mystical movement of Islam), and in providing an unusually beautiful and comprehensive set of color illustrations showing the instruments, aspects of the relationships of music to the rest of culture, poetry and arts, and some historical figures and scenes. The principal author, Jean During, is a French scholar who has spent years studying a variety of Persian musics in the field. During’s contributions provide interesting approaches to the technicalities of Persian music, explaining the system in somewhat different terms from those of earlier authors mentioned, largely through emphasizing the mystical and poetic roots of the art. A chapter by Dariush Safvat himself lays out his approach to the principles and the philosophy of Persian music. The book ends with a useful discography and bibliography. The Art of Persian Music is accompanied by a CD of 12 recordings providing a wide-ranging survey of Persian classical music, including improvised and composed genres, a variety of instruments and samples of music recorded form the 1930s to 1988. Although recordings of Persian classical music are now widely available in the “international” sections of most larger record stores, the CD is an enormously helpful adjunct to this interesting and beautifully produced volume. For centuries Persians regarded music and musicians with social contempt. Only religious music was acceptable. Middle and upper class sons were not encouraged to become musicians because of their noisy, frivolous, rowdy reputations. In recent times, enough gifted instrumentalists have almost changed this attitude by performing in concerts, teaching in schools and universities, and raising the level of understanding among the people. Traditional Persian music has been integrated via travelers with Arabian, Turkish and Western European themes and become intertwined with language and poetry. Scales, rhythms and melodies peculiar to Persian (Iranian) music are explained and analyzed. Names of traditional music-making are given in English and Persian and described in detail. The ethnomusicological character of the music is examined. Persian music, it is said, is modeled on poetry, and poetry is woven from musical sonorities. Nava’i was the best disciple of Nayeb Asadollah, the grand master of the ney in the last part of the nineteenth century. Here he plays a short, sharp ney, the way his master liked it. The most remarkable thing about this short solo piece is the density of ornamentation and the speed of the flow. Five minutes of Nava’i contain more melodic material than fifteen minutes of themodern ney. This is characteristic of the old style. Each section is introduced by a fragment of Pishdaramad played on the tar, ney, and zarb. Born in 1933 in Farahan-e Tafresh, , `Askari began studying music with his father, an old “Ta’ziekhan” (singer of religious operas); was a student of Hoseyn `Ali Khan-e Nakisa; and finally studied with the great vocal master, Aqa Zia Rasa’i-Zakerin, a religious keeper of a very valuable repertoire. Motivated by a love beyond music, he was in the service of the master during his final years, and the only one with the master’s total repertoire. `Askari never dreamed of being a performer or teacher. He sings only for his friends, a closed circle of mystics. This extract of Rast-Panjgah shows with great flair the beauty, nobility, and originality of this radif. Connoisseurs will discover, for example, that rhythmic pieces, which everyone thought to be purely instru­mental, could be sung equally well by the ancient masters. After a solid musical formation on the santur, setar, and violin, with such the great masters as A.H. Saba and Habib Soma’i, Dariush Safvat concentrated on teaching, research, and, most of all, the safeguarding of traditional Persian music. For many years he was director of the famous Markaz and was of immense service to traditional music, which was then in great dan­ger. His latest service is to convince ‘Askari to perform. Jean During is an Iranologist, musicologist, and researcher at the Centre National de la Recherche Scientifique, Paris. His many books and articles on the music and culture of Iran and the Near East have given him an international reputation and made him one of the foremost scholars in the field. He has been playing Persian music for over 25 years. Zia Mirabdolbaghi is a painter, calligrapher, and musician. A PhD. is art history, he teaches Persian music at the National Conservatory in Nice and is the cultural director for the city of Vence, France. He is also an accomplished zarb player. Dariush Safvat is both a scholar and performer of Persian music. Although he received his PhD. from the Sorbonne in law and political science, his main love has been Persian music, and he continues to be a major force in the preservation and the development of traditional Persian music.